With garden tools by Sneeboer & Zn you can be sure of the highest quality. Products that are characterized by age-old traditions, made using state-of-the-art techniques. These ergonomic garden tools are entirely hand-crafted and finished in Holland. Sustainability is kept in mind as well. The traditionally crafted products are made of superior stainless steel and wood that has the FSC quality mark. Long-lasting products for our generation as well as for the future. Our customers demand quality. Not only do they want garden tools that will last for years to come, they also want tools that ease the work and make gardening as enjoyable as it used to be. “Going back to your roots”, that’s what we call it. Tools that combine the sturdiness of yesterday with smart innovations of today. Sneeboer & Zn has tools for everyone. 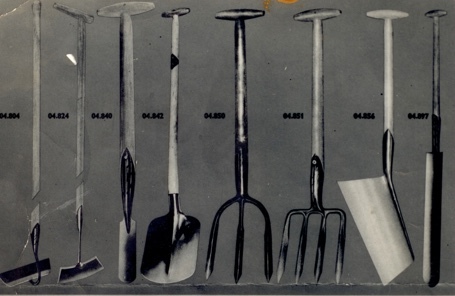 The garden tools are available in various versions, for example for left or right-handed people and suitable for use while standing up or kneeling down. Our ‘luxury line’ is aimed at ladies and gentlemen with smaller hands. The long handle offers more grip and a better hold! We also offer various possibilities and solutions for the storage and maintenance of the tools. In addition, we can decorate the wooden handle of your garden tools with beautiful engravings. Our craftsmen give traditional tools a make-over by applying novel ideas. Take for example our Royal Dutch Hoe. Thanks to the teeth at the front, weeds are no longer easily pushed to the side. The ‘hooks’ at the rear eliminate the weeds on the ‘pull’ stroke. As a result, more weeds are removed with the same amount of effort as compared to a regular old-fashioned hoe. By using innovations we build new traditions. The family business was founded in 1913 by Arie Sneeboer. His goal: to create the very best garden tools for the local community. In 2013, the company celebrated its 100th anniversary and was awarded the title of ‘purveyor to the royal household’. Currently, the family’s fourth generation is leading the company . The same standards and values still take centre stage, though nowadays you can purchase these quality garden tools online. They are sold worldwide and highly valued by demanding gardeners who choose durability and craftsmanship.